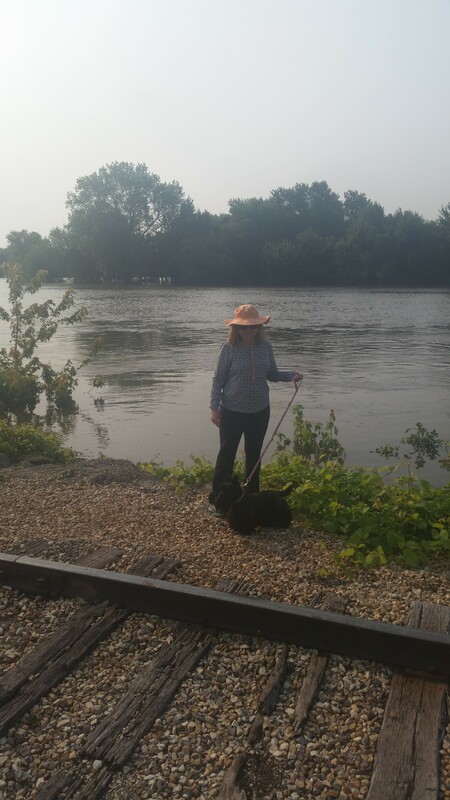 Walking – Walking – Walking Down the River! 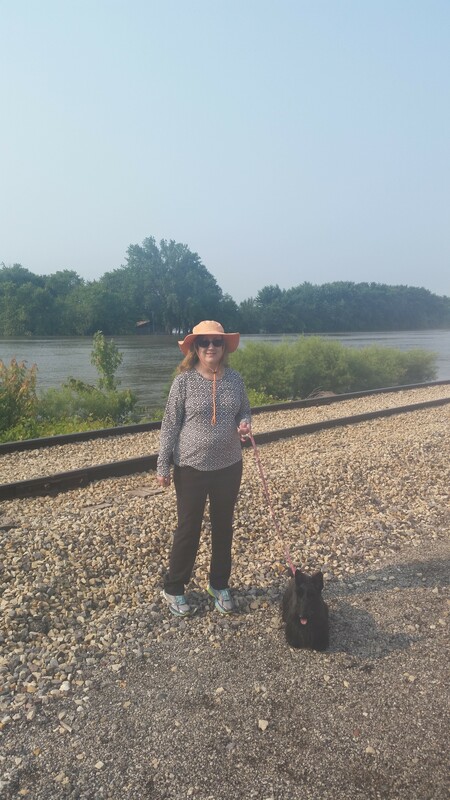 So, today, Mama and I, on our morning walk, headed down to the Illinois River. It had been flooding a lot lately, but has been going down a lot in the last few days. 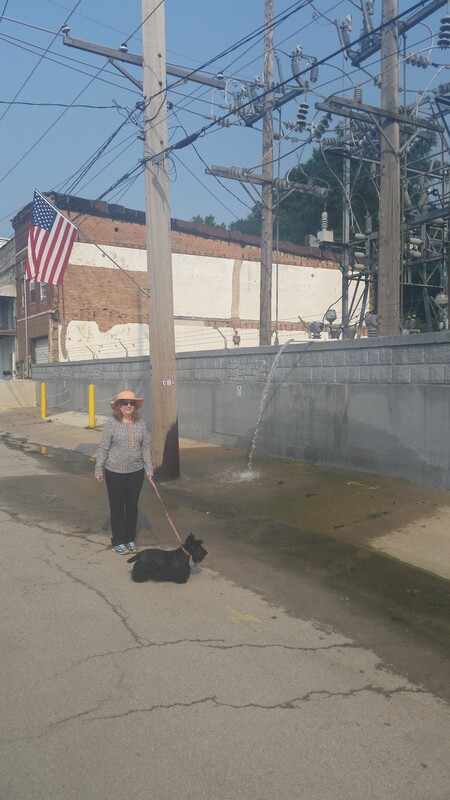 Here we are in front of the power station – which got flooded too, hence the water they are pumping out. Name of this street is Water Street – and as you can tell, if you look closely, there is still water flooding the street a little bit behind us. 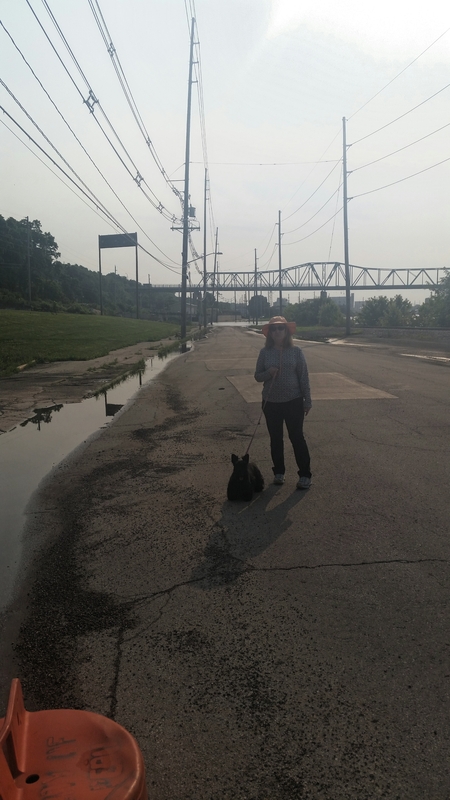 Also, don’t know if you can see it, but there is a fence on the bridge behind us. A prominent attorney jumped to his death from that bridge to the street below about a decade ago. Sad. Very sad. Another Picture of me by the river. You might can see that the river has flooded the trees and the field behind the trees on the far side. And another picture. 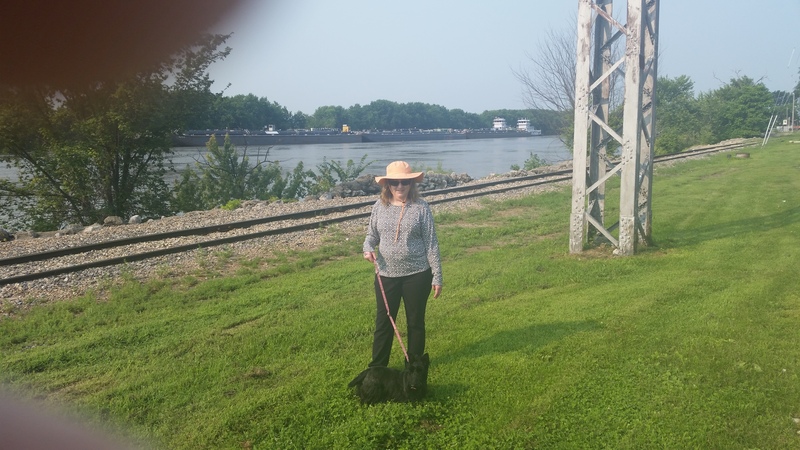 See the barges behind me? They aren’t moving now, cause the river is flooding. One barge captain told Catman a few years ago that the crew carries around baseball bats, cause the rats on the grain barges get HUGE! They should just hire Angus Fala Worldwide – Pest Control Services. This was like Mama’s favorite Restaurant. It was the Red Door Inn, and it was THE place to go in the 70’s and 80’s. Unfortunately, it’s been closed now for about a decade. Too many floods from the river, I suppose. See to the far right of the picture, can you see the thing protruding out of the roof? That’s a Railroad caboose. The restaurant was actually built around it. You could eat in the boxcar. Neat. Though it’s been closed for about 10 years, the tables are still set, with table cloths on them in the Red Door. Looks like it just closed last night, and will be open later. Unfortunately, it won’t ever open again. Sad again. That’s it for my tour. 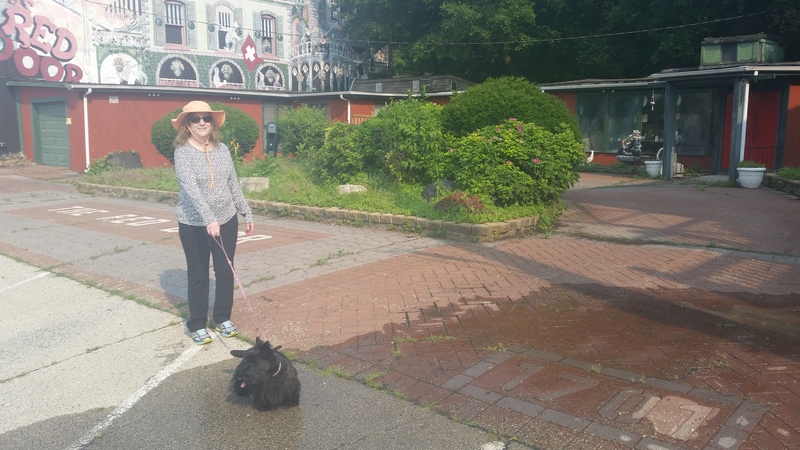 Thanks for joining me on my walk today! Next Post Happy July 4th! I loved this walk. Thanks. I guess Barry Bonds, Mark McGwire and Sammy Sosa get brought in for the tough jobs. yes…performance enhancing drugs helps in fending off the really big rats. That was an awesome tour…you have a facinating route….but where are the Llamas? I keep asking, but never get an answer……..
We like geography lessons and a little history thrown in is nice too. 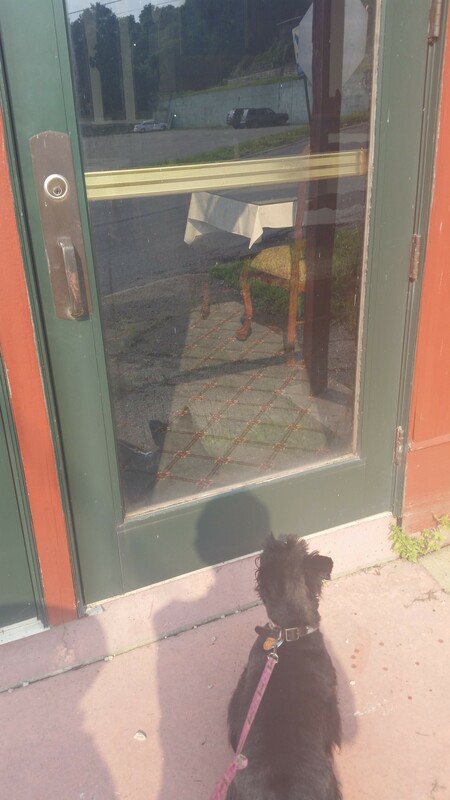 Well, it doesn’t hurt to be taught by a pretty Scottie.